Editor’s Note: This essay first appeared on the Deep Green Resistance Blog. We think this analysis is relevant to all regions. This entry was posted in Protests & Symbolic Acts, Strategy & Analysis and tagged Ecosabotage, Video on August 22, 2015 by DGR Editor. 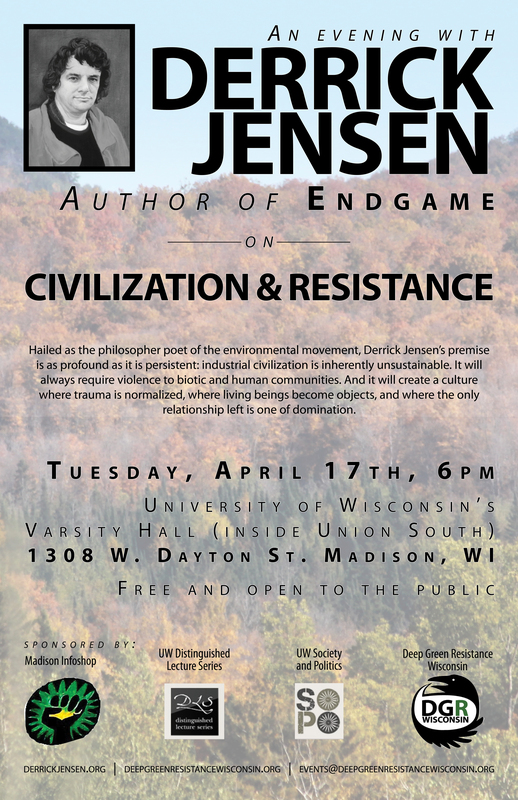 Almost every Sunday, Derrick Jensen interviews an activist, biophile scientist, land restorationist, or other person similarly engaged in building a culture of resistance. The interviews are always worth listening to, packed with interesting information and insights drawn out by Jensen’s experienced questions. The interviews have always been available as mp3 downloads or audio streams from PRN.FM (you can also browse just the interviews related to Deep Green Resistance). We’ve now made Resistance Radio available on youtube as audio with a still image of the interviewee, accessible to those who prefer to browse youtube or want to add the episodes into playlists. We’ll keep adding new interviews as they’re released. 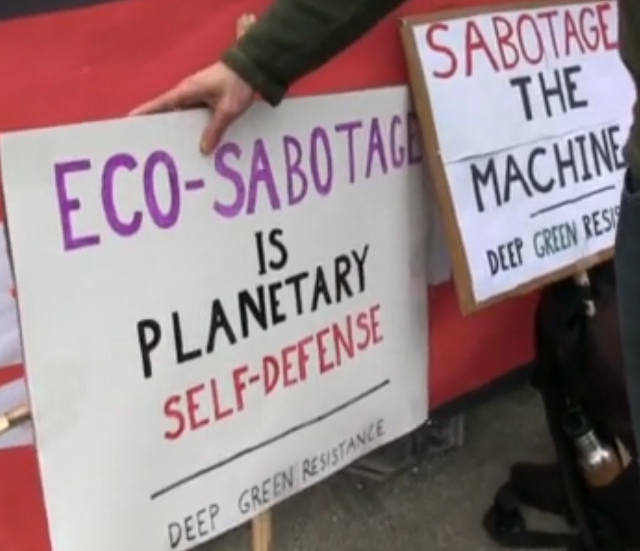 See them all at the Deep Green Resistance youtube channel, and please share these important conversations widely! This entry was posted in Education and tagged Audio, Derrick Jensen on November 17, 2014 by Deep Green Resistance Wisconsin. 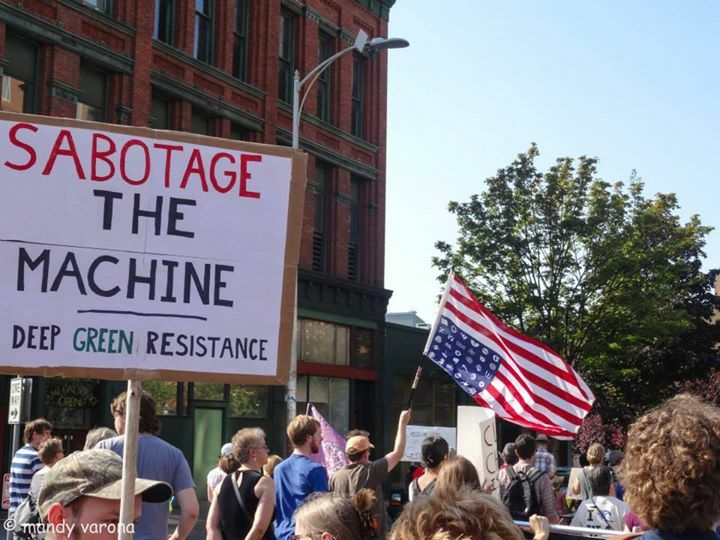 For the past several months, the Wisconsin Chapter of the Deep Green Resistance movement has been building its own capacity and helping the international movement with campaigns and projects. We recognize that one of our major goals as a chapter of the larger DGR movement is to simultaneously support DGR as a whole and bring the movement to our locale. Without a strong international movement, local resisters would have little support in their efforts. Yet, without resistance happening locally, the more broad structure would be irrelevant and ineffective. Since 1990, Earthfest’s mission is to provide a joyful, annual, free family festival in Sheboygan to promote community spirit and a healthy environment through music, art, education, lectures, stories, demonstrations, and local foods. From behind our table, we engaged in conversation with several folks about our organization and perspective. As is predictable given the tone of the so-called environmental movement in the United States, many whom we spoke with were not of the mind that resistance is even a possibility. They know the problems, but don’t know what we can honestly do to stop them. This is a major reason why DGR Wisconsin participated in Earthfest; we want to bring a radical analysis into the environmental milieu. The festival now being over, and many of our pamphlets seeing the fresh eyes of it’s attendees, it’s hard to say what impact our presence will have. Though, we will keep spreading the seeds of resistance and attempt to build a movement to save the planet. Many thanks to organizers of Earthfest for putting the event on and allowing us to participate. As always, the resistance needs you, and our group has expanded it’s options for getting involved, so please consider joining us in our fight for the future. This entry was posted in Education and tagged DGR activity & statements on August 21, 2012 by Deep Green Resistance Wisconsin. Flyer for kick-off event. View facebook event here. Grassroutes Caravan is a mobile bicycle village of resilience that is heading to Chicago to protest NATO this May. GRC organizer and member of DGR Wisconsin, Thistle Pettersen, says there is still room in the village for more riders and a DGR crew would be welcomed with open arms! Each year, the Grassroots Caravan sponsors a cycling trip to different points in the Midwest. This year’s event is entitled Cycles of Revolution: ¡Brake the Banks!. Forty people participated in the group’s annual trip in 2008 to the Republican National Convention in Minnesota. This year’s trip is limited to 50 participants. According to their website, this trip is to “promote and demonstrate peaceful forms of cooperative, collaborative democracy in the face of the endless wartime rhetoric of NATO.” Using bicycles as the vehicle to travel to Chicago is in tune with the NATO summit, because the wars NATO engages in are frequently fought “to secure oil and gas resources,” of which the bicycle uses none. The Cycle of Revolution will stop in three communities along the route to participate in community events. As has been tradition in the previous three trips the group sponsored, particpants engage in community service in exchange for places to stay during the journey. Currently, approximately 20 people have signed up for the event, which leaves Madison on May 13. A kick-off fundraiser is scheduled for May 5 in Madison. The group has been holding fundraisers since January. To get involved in Grassroutes Caravan, you can apply to ride or get in touch with the organizers. This entry was posted in Protests & Symbolic Acts and tagged DGR activity & statements, Thistle Pettersen on May 3, 2012 by Deep Green Resistance Wisconsin. Val of Deep Green Resistance Wisconsin speaks on direct action against industrial civilization at the “Occupy Spring and Beyond” Teach-in, held in Madison, WI on April 14th, 2012. This entry was posted in Direct Action and tagged DGR activity & statements, Video on April 16, 2012 by Deep Green Resistance Wisconsin. Members of Deep Green Resistance Wisconsin will be representing our group at the upcoming Organizer Planning Meeting to Protest NATO/G8 Summit. The meeting is taking place on Saturday, February 18th, 2012, in Milwaukee, WI. Antiwar, student, and labor [and radical environmental!] organizers from around the city of Milwaukee will be meeting on Saturday, Feb. 18, 1 pm, at The Center Street Library (2727 W. Fond du Lac Ave.) for a planning meeting to found a Milwaukee Coalition to protest the NATO/G8 Summit in Chicago this May. This entry was posted in Protests & Symbolic Acts and tagged DGR activity & statements on February 18, 2012 by Deep Green Resistance Wisconsin. Deep Green Resistance Wisconsin member Thistle Petterson was interviewed in the Chicago Tribune about her organizing involvement in the group Grassroutes Caravan, which plans to bring a group of at least 50 bike riders to Chicago during the G-8 and NATO summits to protest for a living planet and an end to imperialism. Their bike ride is called Cycles of Revolution: Brake the Banks. DGR Wisconsin supports Grassroutes Caravan and their goals of human-scale, direct democracy. We are proud and excited for our member and supporters involved in this project. This entry was posted in Protests & Symbolic Acts and tagged DGR activity & statements, Thistle Pettersen on February 11, 2012 by Deep Green Resistance Wisconsin.